You must have heard of Spotify, right? Similar to other available audio streaming services, Spotify have been in the news a lot recently, trying to compete with Apple Music through rebranding with a little tweak on the logo. It feels so great to be able to listen to your favourite songs without having to trouble yourself with updating your playlist to keep it updated with the latest songs. 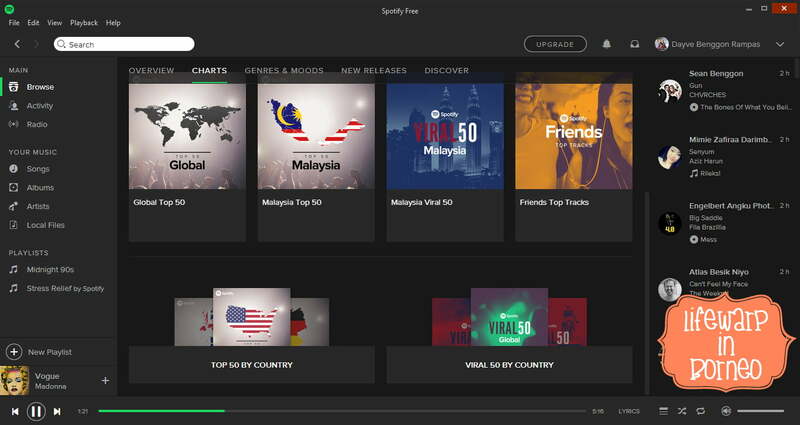 Getting a free account with Spotify is indeed a genius marketing strategy as it makes music listeners from all over the world (includes me) to choose Spotify as their music subscription. I signed up a free account with Spotify. I must say that I love the site as it’s quite minimalistic. It’s only takes a few minutes to sign up a new Spotify account, and then you will be asked to download the software. I choose to have Spotify installed on my computer as I find Spotify apps is going to munch down larger space. Spotify has a great number of music in its library. Users can easily find music by finding a song, album, or artist they like. It also has radio feature which user can activate. The best thing is users can always create their own playlists and share them with everyone. Apart from that, Spotify has their own line of playlists that are keep updated with new tracks. 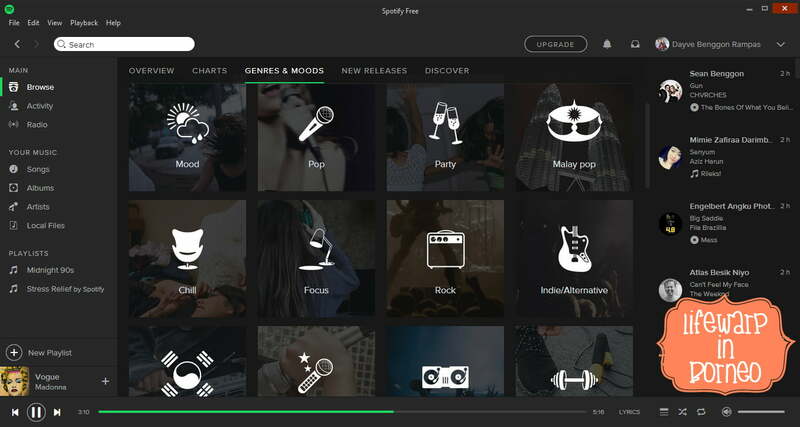 Users can also find new released albums from the categories, making Spotify the best place to keep updated with the new and latest music. The login page is rather simple, making it easier to load, and FAST. 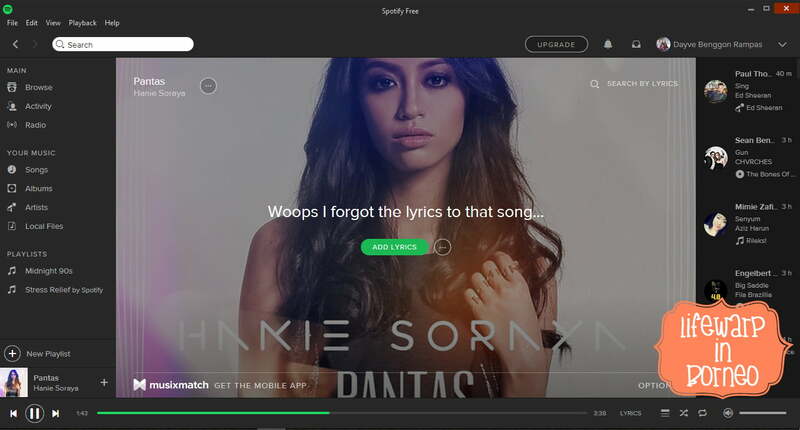 Upon signing up, users are asked to pair up Spotify with their Facebook account. Users can also find their Facebook friends and see what they’re listening to. There’s a private session which can be set for a single session or permanently. Moreover, the sound quality is great with a strong Internet connection or data signal. Looking for Malay songs? Spotify have them all in one place. 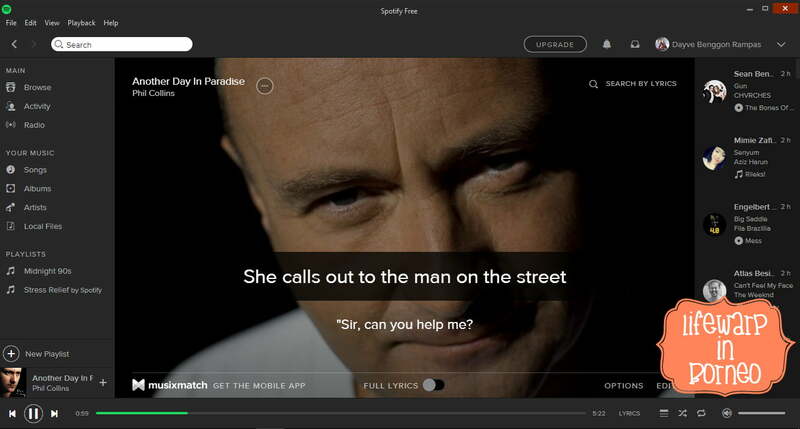 Frankly speaking, the best thing I find about this Spotify is the lyrics feature. I find it’s awesome as I can sing along with my favourite songs. Yes. Spotify has K-Pop, too. I also find a few Malay songs that don’t have lyrics. It would be great if I could sing those songs with lyrics. I find there are tons of drawbacks as I use the free version of Spotify. It is only good to get your first impression. 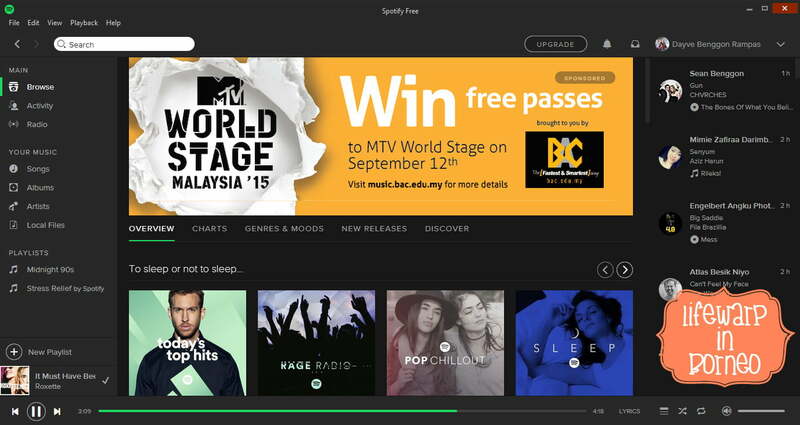 It’s still acceptable to be interrupted by ads because that’s how Spotify can cover the costs. With this free account, I can only shuffle songs from an album, playlist, or radio station. There’s no offline listening feature made available for free account. Spotify updates you with latest music, and you can always find something to cater your music-hunger. I read a few reviews before downloading Spotify, and one of the reviews mentioned that free version would only allow to listen up to 10 hours per month. With Premium version ($9.99/month or MYR 14.90/month), you can get full-fledged features, no ads, unlimited streaming, and the best thing is extreme 320kbps sound quality. The lyrics feature is the most amusing. I can finally sing with glee. For the price of an album every month, you get the full-fledged version. With the premium option you not only can stream unlimited to your desktop, but also to your mobile devices, using offline mode and home audio systems such as Sonos and Squeezebox. Also you get top sound quality with many tracks being provided at 320Kbps. I guess I will have to get Apple Music after I hit my 10-hour limit this month. Oh, I can always listen to Youtube.